Head. N5 and N6. No representational figs. 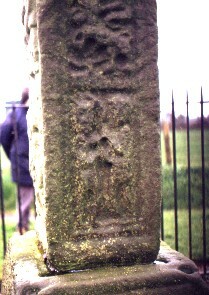 End of cross arm, unidentified figures, very weathered/worn. S1 Cain Slays Abel. Book of Genesis. Old Testament. 2 figures are depicted with Abel standing. S2 David kills the lion. Type 1 David on the lion's back. S2 David kills the lion. Type 1 David on the lion's back. Old Testament. 1 Samuel 17.34.